The Metro is the easiest and the most reliable way get around Moscow. Its layout is quite simple. Radial lines, which cut across the city in most directions, are joined together by a circular line, which also joins together the city's largest railway stations. Transport system also includes monorail and Moscow Central Circle (MCC). Each radial line has its own name, number and colour on the metro map, and you can get from practically any station to another one with a maximum of three transfers. 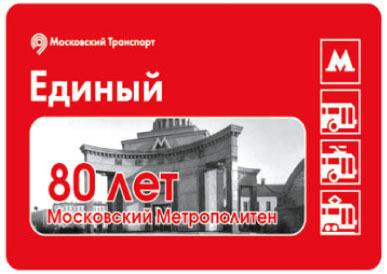 To pay for your ride, buy smart-card ("Ediniy" or "Troika") from a cashier in the metro (monorail, MCC) station vestibule. Recline smart-card to a yellow circle on the automatic gates, when green light is on or displays the number of remaining trips - pass through the gate. No matter how long you ride or how many transfers you make, you pay no extra fee. If you expect to use the metro for several weeks in a row, you can save some time and money by buying a monthly pass. To help you find your way, there are several multicoloured metro maps in every car, and a loud speaker that announces the name of the station at every stop. The doors open and close automatically. There is a first-aid station and police post at every station. For information you can turn to any metro employee - they wear blue uniforms and red hats. 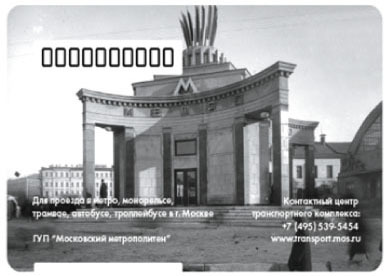 Mobile communication (GSM) works at stations of the Moscow underground. Free Wi-Fi ("MT_Free") available in trains. The Metro starts work at 06.00 a.m., but stations open at 05.30-05.40 a.m. At 01.00 a.m. the entrances close and passengers must complete their transfers. Last train leaves also at 01.03 a.m.
Moscow Monorail (line 13) works from 07.00 a.m. to 11.00 p.m. every day. Transfer from metro to monorail (and back) is free 90 minutes from first enter. Moscow Central Circle (MCC, line 14) works from 05.45 a.m. to 00.30 a.m. every day. Transfer from metro to MCC (and back) is free 90 minutes from first enter.